As one of Europe’s hottest cities, Berlin, Germany is teeming with the latest shops, restaurants, galleries, clubs and boutique hotels. But it’s also a city with a rich history and a lively art center, where monuments, government buildings, classic museums and creative venues have been designed for foreign visitors, locals and the next generation. 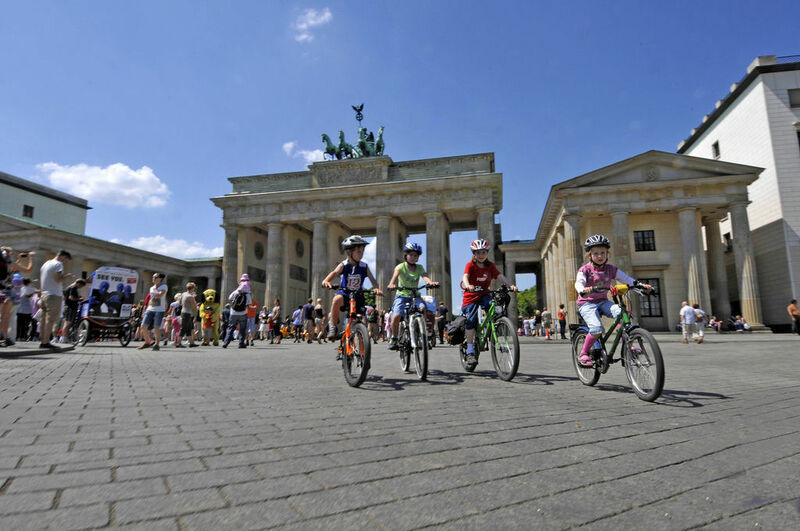 Read on for what’s best with kids, and for further sightseeing suggestions and events calendars, visit the very informative Berlin Tourist Information website. A good way to start your journey through the city is at this interactive, multimedia exhibit. Viewers walk through well-labeled displays and themed corridors to immerse themselves in centuries of history and Berlin culture. There’s a guided tour (German and English) of an original nuclear-proof bunker and a Little Bear Gallery that helps children understand the city’s history through its mascot, the bear. (Look for the city’s symbol of three dancing bears on public vehicles and many signs). The Story of Berlin exhibit is located on the famous Kurfurstendamm (known as the Ku’damm) near the Savignyplatz subway and the Zoo. For kids from ages 4-12, this modern museum offers interactive programs, including art labs, and a vintage printing press where kids can create their own texts. One of the highlights is a 21-foot-tall wooden maze featuring winding stairs, dead-ends and mysterious rooms. Who knew that the Berlin Zoo had more species than any other zoo in the world? Among the many, many inhabitants, one of the stars is Knut the polar bear. Younger children will enjoy the petting zoo and adventure playground. The zoo is not hard to find since it has its own U-Bahn stop, not far from the shopping area of the Ku’damm. On that famous street (at #200) you’ll also find another kind of zoo—the Steiff Shop with its extraordinary array of heirloom quality stuffed animals. For those traveling with children above age 6, we highly recommend the Judisches Museum. Given the history of Germany, it is a must-see stop. The building is a striking, titanium-clad edifice designed by noted architect Daniel Liebeskind. The Permanent Collection meticulously details both the richness and the sorrow of Jewish life in Germany and Berlin throughout the past two millennia. The Holocaust section (Persecution, Resistance, Extermination) is, as you would expect, particularly poignant. There is lightness too – at our visit, all the Christmakkuh memorabilia created for mixed marriage holidays was on display. The collection is large and challenging, but do not miss the Garden of Exile outside. Open daily. We went off and even under the beaten path to explore the subterranean Berliner Unterwelten or Underworld. During WWII Hitler commissioned an extensive complex of bomb shelters for the civilian population around the city, most of them within the subway system. A non-profit group, Berlin’s Underworld Association (aka The Society for the Exploration and Documentation of Subterranean Architecture) has organized volunteers to help preserve some of these spaces and lead organized tours. It’s eerie to walk through this complex of rooms that held thousands of people for days at a time while Allied bombers pummeled the city above. The guides evoke the daily experiences of these civilians as the society began to collapse above them. You can feel the subway trains rumble beneath the shelter and imagine the impact of bombs falling above. Nearby is a structure with a similar function called a “Flak Tower”, which is a partially exposed concrete bunker measuring 210 feet square and 120 deep. These shelters were designed to hold and protect up to 15,000 civilians inside the 7.5-feet thick walls. Volunteers lead tours of the subway bunkers all year, and tours of the Flak Tower from April-October on certain days. Minimum age is 14, and children under 18 must be accompanied by an adult. Call for times of English language tours 030/49-91 05-18. All tours start at the office, which is located in an entrance to the U8 Gesundbrunnen subway station. It’s slightly tricky to find, but if you go up the hill from the station and shopping complex attached, you’ll find a subway entrance among a row of shops. Inside you’ll find the office of the tour. On the grounds of the former headquarters of the Nazi SS and Gestapo (the much-feared secret service), a deeply moving exhibit called Topography Of Terror has been erected. The building was leveled during the war, but the basement where prisoners were tortured remains as an open-air exhibit. There is a documentation center about crimes committed during the Nazi era. Journey back into Medieval times together at the Spandau Citadel, a real castle that once housed knights and their court. Inside the moat, you can explore the towers, dungeons, halls and winding staircases once frequented by German knights. Children seem to love the combined experiences available in this compound of technology, one of the largest science centers in Europe with around 250 experiments explaining the physical phenomenon of our life and our environment, along with an amazing collection of technological wonders, among them full-sized ships, a DC-3 airplane, and machines of wondrous variety. Witchcraft and magical powers, mythical knowledge and the supernatural can be explored in the cellars of this historic former blacksmith building close to Berlin’s Hackesche Markt. Open since summer 2014, Berlin’s Magic Museum features over 450 exhibits. Included are magic devices ranging from a Dutch witches’ scale and torture instruments to African totem masks, crystal balls and a historic Samurai sword. Curated to be more entertaining than strictly academic, the spellbinding exhibition encourages intuitive exploration. Open daily. Small museum featuring the images and sculpture of major graffiti artists, as well as drawings and sketches for major urban art projects. Definitely worth a visit, but the real collection is out on the streets, on the walls of the residential buildings of Bulowstrasse, where they should be. Remarkable variety of artistic styles, all skillful and fresh. Berlin is covered by a spider’s web of canals and rivers, the Spree River being the largest one. An interesting view of the city is available on the regularly scheduled boat tours, which use taped narration in several languages to explain the passing sights. Most companies operate year-round; check with your concierge for a recommendation or visit the website of one of the best boat companies, Stern und Kreis. Since the 25th anniversary of the fall of the Berlin Wall, all eyes have been on the many historical markers in the city that commemorate the decades of separation between East and West Germany that manifested itself in Berlin. Unfortunately, only 1.4 kilometers of the original Berlin Wall stand in place today, with its graffitti-splashed concrete slabs, barbed wire and an original East German bunker, collectively known as the Berlin Wall Memorial. Much more fun to visit, is the privately curated collection of memorabilia known as The Berlin Wall Museum (Mauermuseum) at Checkpoint Charlie, begun in 1962 by local historian Dr. Rainer Hildebrandt. Kids will be fascinated by the tales of heroic escape attempts, and the display of many vehicles (even a hot air balloon and a mini submarine) invented to circumvent it. The UNESCO World Heritage site Museum Island is the epicenter of historical art in Berlin, a complex of museums on a large plot of land made an island by the Spree River on one side and a canal on the other. One of the biggest hits on the island is the Pergamon Museum which has several dramatic exhibits. The Altar of Zeus from Pergamon is a large structure ripped from its roots in Turkey and reconstructed here by German archeologists in the early part of the 20th century. It’s big, it’s impressive, but my favorite exhibit is found in the next room—the Ishtar Gates and Processional Way from Babylon. Beautiful glazed tiles with images of lions provide a small taste of what a grand city this must have been. Don’t stop with these two exhibits for this is a must-see museum with many treasures. Due to extensive renovations, the Pergamon Altar will be closed until 2019; however, the Market Gate of Miletus, the Ishtar Gate and Processional Way from Babylon will remain open during this time. Closed Monday. Another big hit, the oldest museum on the island and one of the oldest in Europe is, appropriately, the Altes Museum (translates to Old Museum), which stands majestically in front of the Pergamon. It has a wonderful collection of Greek and Roman art. Also notable is the first floor Rotunda, with its collection of classical statues. Open daily 10am to 6pm, Thursday until 10pm. After a €200 million renovation, the Neues Museum highlights the archaeological collections of the Egyptian Museum and Papyrus Collection, the Museum of Pre- and Early History, as well as works from the Collection of Classical Antiquities. The most renowned is the gorgeous bust from 1340 B.C. of Egyptian Queen Nefertiti, described as “the world’s most beautiful woman.” She greets visitors in the north cupola of the building. The Alte Nationalgalerie is the third open museum on the island, though you or your children may well be suffering museum fatigue by now. It specializes in 19th century European painting and sculpture. To see the latest in contemporary art, head for the Neue Nationalgalerie or the Sammlund Berggruen. Also, you’ll find galleries in the formerly Turkish and now edgy and hip Kreuzberg neighborhood and in the Mitte area, particularly on or nearby to Auguststrasse. Money-Saving Tip: If you plan to go to more than one museum, buy a three-day pass (Tageskarte) and save. Where a single museum ticket can be as much as €8, a three-day pass good for all state museums (about 70 museums and collections) is €24. Children under 16 are admitted free. Tageskarte can be purchased at the ticket office of any of the museums or online through the Berlin Tourism website. If there is one powerful image of the complex German past that stands today, it is the grand seat of the Bundestag (Federal government) built in the late 19th century to house the Parliament of the newly formed German state. Part of it was mysteriously burned in 1933, an event used by the Nazis to justify their ruthless persecution of political opponents. After the war it was rebuilt and from 1994-99, the Reichstag was renovated to again welcome the German Bundestag returning from the old capital of Bonn. A grand atrium dome was added to the top that is now a real draw for locals and tourists alike for the great panoramic views of the city. A very fine restaurant, Kaefer’s Restaurant Dachgarten (030/226 29 935), occupies a sector of the dome and provides excellent food to complement the view. Reservations are a must. Open daily. Virtual tours of the parliamentary square are available on the website. Located a few hundred yards from the Brandenburg gate, the Place of Remembrance (Denmal fahr die emordeten Juden Europas or the Memorial to the Murdered Jews of Europe) is Berlin’s Holocaust memorial. It is a large outdoor field of 2,711 dark concrete blocks of different heights, structured in a grid forming walkways. It is quite startling and moving in its impact, a belated acknowledgement of that tragic era of Germany’s past. There is an underground Information Center, closed Monday. The Memorial is always open. This famous archway has stood through several centuries and many wars since 1791, and remains the central symbol of the city and the only standing city gate. In the divided city, the Gate stood in East Berlin just inside The Wall. Restored, it still stands grandly at the head of Pariser Platz, the broad avenue which leads to Unter den Linden. The main street of the former East Berlin, Unter den Linden has an extraordinary collection of buildings from many historical eras, and exciting new ones from internationally renowned architects that have replaced the empty lots left by the bombings of World War II. Walking further down Unter den Linden you’ll come to Museum Island. Near Museum Island, you’ll find the Nikolai Quarter, the oldest part of Berlin. Sitting beside the Spree River, this area dates from the 13th century. Its charming lanes and medieval buildings were rebuilt in 1987-88 after their almost total destruction during the bombings of WWII. You’ll find shops and restaurants and the beautiful Nikolaikirche. The interior of this historic church is now an annex to the City Museum. Also notable is the Emphraimpalais, a masterpiece of Berlin palace architecture that is now used for exhibitions. This building survived the war because it had been completely dismantled and stored for a street widening project in 1935. In 1983 it was brought out of storage and rebuilt. Dear Ron, respect! – You are a real Berlin Expert. I am a Manager from a Berlin Hotel , just a minute away fom the entrance of your discribed Berliner Unterwelten. Very good review over the Berlin Sights- hope to see you one time back here in Berlin. Best regards T.
Thank you for your response to my story. I am a huge fan of Berlin and have visited several times over the past 30 years. I worked hard to include the best of the city, but if you have updates, they would be welcome.